New ideas and black and white cartoons to help both the bully and the victim! 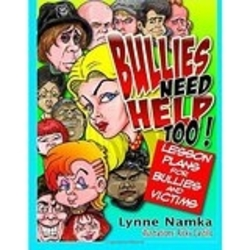 Practical ideas and activities from the latest worldwide research on bullying! Help children who bully recognize and break into feeling of their disgust and contempt that lead to harmful behaviors. Help your middle schoolers and teens learn strategies to control angry feelings and break into errors of thinking that it’s okay to harass others because it feels fun. The lesson plans teach the values of respect, tolerance of differences, empathy and feeling good about stopping harmful acts. They foster kindness and expose children to the addictive feel-good emotions that being supportive with others bring. They give positive ideas with strategies for victims on building assertiveness and how to walk tall, deal with bullies and build confidence and good self-esteem. Included are fun cartoons of kids and teens to challenge teasing and harassment.